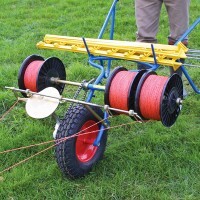 Erect and dismantle up to four lines of electric fencing in the fraction of the time it takes to do the job by hand. Manufactured in our own workshops, our unique Rappa fencing machines are lightweight, strong and rigorously tested. All the ease, speed and functionality of our more sophisticated Rappa fencing machines, but man rather than horse-powered! All the functionality of our Standard Rappa, but with an added automatic wire feed. 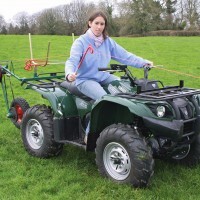 Powered from the back tyre of your ATV, our top-selling ATV Rappa will tackle the toughest terrain and most challenging electric fencing jobs. The newest model is designed for easy handling, incorporating sealed bearings for longer life and less servicing. 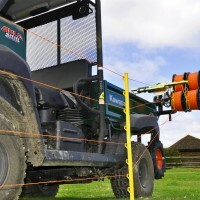 No job is too big for our heavy-duty Trailer Rappa fencing machine, the ultimate electric fencing solution for the serious farmer. 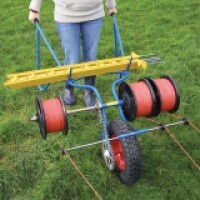 Designed for large stock farms with long fence runs, the Trailer Rappa carries up to 5km of wire and stakes, while allowing just one person to quickly erect or dismantle up to four lines of electric fencing in minutes rather than hours. 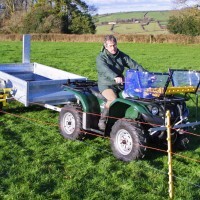 Each Trailer Rappa comes with its own fully galvanised, heavy-duty, all-terrain trailer, which can carry an ATV in transit along with your fencing equipment. You can easily detach the Rappa mechanism, leaving the robust 500kg trailer for all your other farm jobs. We've even included road legal lights and the option of detachable extended livestock sides and cover. 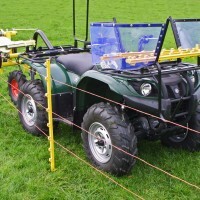 A smaller, lighter and more streamlined version of our best-selling ATV Rappa Fencing Machine, designed for single line electric cattle fencing. Powered from the back tyre of your ATV. British weather being what it is, we thought our customers would appreciate an undercover version of our popular ATV Rappa fencing machine. The RTV Mule offers all the unique features of the ATV model, as well as providing more capacity to carry wire and stakes and a dry roof over your head!